« And so say all of us…. This Post was posted in History, Speedway and tagged Peter Craven. Bookmark the permalink. Hey Allan, I think your painting captures Peter’s style just right. His left foot would be a few inches off the ground as he powers the bike off the turn. I had previously thought the left wrist not quite right but either I was mistaken or you have tweaked it. Anyway, its all good now. Duly tweaked, Tam! Thanks for the reply. The vitriol’s because of the way New Meadowbank has been left to rot and now needs millions to renovate. Plus the guys at the speedway museum made a commemorative plaque and took some efforts to celebrate the life and passing of PC. And after a few years it’s just chucked away or removed and forgotten. Yes, I share your disgust, but then I have low expectations of local authority apparatchiks. 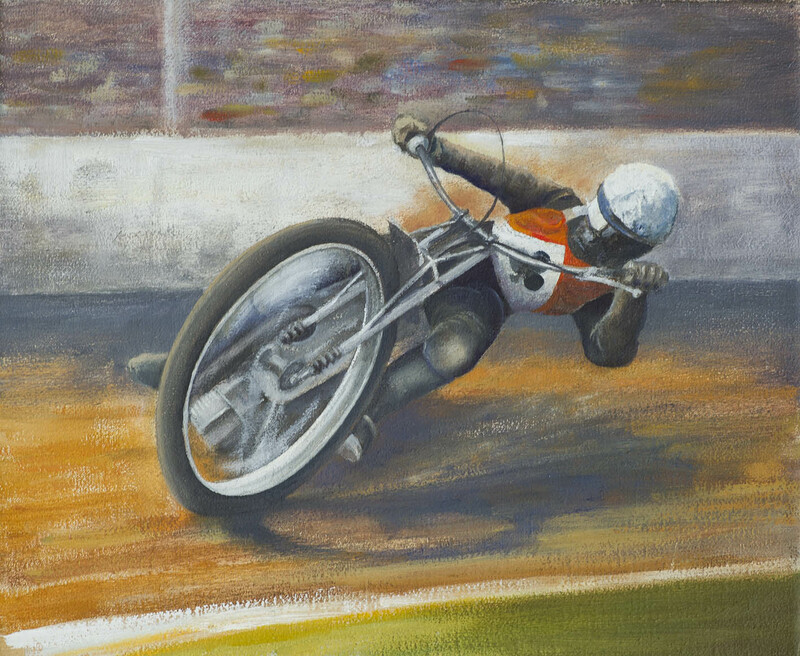 Also, its unlikely any of them even remember speedway at Meadowbank. BTW, the drummer in my dad’s band was Sammy Marks, brother of Bob, the Monarch’s captain. And the pianist was Tommy Merrilees, brother of the Chief Constable. Since the bandleader was also a Scottish hill climb champion, the Harmony Players were an eclectic set! Loving your work as ever, Allan – and a Happy Christmas to you and yours! Hi David and a great Boxing Day onwards to you. Ruth and I were at St. Marys on Christmas Eve for the carol service. Good job! Have discovered “Tomorrow shall be my Dancing Day” now. A fine wee tune. All the best! Hi John! Thanks for looking. I’ve almost forgotten this site. Time to resurrect it I think – and plenty to post, hopefully. I was at Meadowbank the night Peter Craven came down. What a fine man!